Women like men, not boys. All the rules of my How to Flirt With Indian Women 101 which I’m going to lay down below are derivative of this one basic rule. Most guys feel shy to start a conversation with a girl face to face. If you’re wondering “How to flirt with a girl if facing her makes me nervous?” – don’t worry; turn to online chat (even if you know your girl in real life). Not having to face or directly talk to the girl you like takes the pressure off to a great extent and helps you be yourself, which is the first step of flirting successfully. Nothing turns girls off more than under-confident desperation. I’ve already talked about this in the discussion on how to impress girls. It’s equally pertinent to the one on how to flirt with girls. Don’t be apologetic for taking her time (girls hate that). Don’t ping her saying “hi”. Ping her saying, “Hi XYZ! How’re you doing?” In case she doesn’t reply the first time you ping her, never use the same opening line the next time. Start by something like, “Hey XYZ! The ABC video you’d shared was hilarious. Where did you find it?” It shows you’re not talking to her because you’re desperate, but because you’ve got something real to say. You get the point. A corollary of point #2 is – don’t be her dog. You’re flirting with your girl; you’re not her boyfriend yet. You need to attract her first, before you show her how responsible you are. So while flirting with a girl, don’t be the oh-so-caring I’ll-do-anything-for-you-including-daily-chores man-in-waiting of hers – that can wait for life after marriage. :P For now, that kind of behaviour will make her like you as a friend and a pet – not as a man she feels attracted to. Each girl has her distinct level of comfort with flirting. Some stop talking to you if you call them hot, while some feel offended if you don’t. ;) Continuously test her limits while flirting with a girl. Try a hint, like, “You’re the most interesting girl I know.” If she responds favourably (favourable responses include :P ;) J), after a few days try, “Of late I’ve started looking forward to you coming online every day.” If that goes ok too, try, “If you were not so busy, I’d have loved to go for a coffee with you sometime.” You get the point. You need to be bold enough fast enough to hold her interest, while making sure you don’t offend her. What are the golden rules which worked when you started flirting with your girl? Let me know by leaving a comment. It was a moment of solemn beauty. The sea a hundred bawling shades of grey. The moon and black chasing each other across the fickle sky. The sporadic drizzles pecking the mutinous waves down below. I was speechless. Just thankful that it’ s all happening. I don’t know when it was –but I guess right after I’d pecked him lightly on the cheek – when my reverie was shattered by the distinct sound of throat-clearing behind us. There he was –short, dark and carrying a colossal round paunch and an even more colossal smile of conceit – the omnipresent (OK with the exception of where he’s needed) Indian policeman. He had apparently known it all along – what we were up to. He’d been keeping a “close watch on us” ever since we parked the car, you see. “The people who live on this road are the most important people of Mumbai,” he warned. “ I’m entrusted with making sure no one disturbs their peace of mind. And you, sir, are doing just that with your obscene acts. So I’ll have to fine you. Rs. 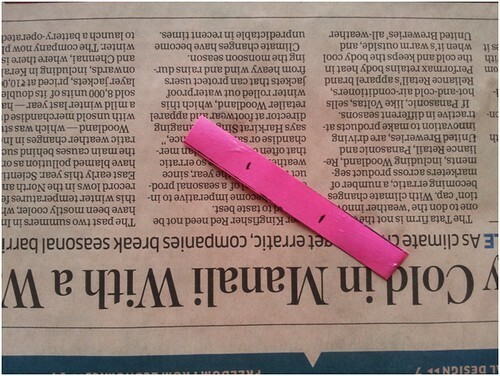 4000.” And with that he pretended to pull out some papers. “But we don’t have so much cash on us. Will Rs. 500 do?? ?” My multiple brained academic star of a husband blurted out. You know who I’m talking about – you’re all familiar with him – the fatherly neighbourhood policeman who always has an eye out for youngsters running a risk of going astray. That well-meaning gentleman who always shows up at the right time and place to teach you the price of a lesson or two on the right way to behave in this country. What makes him so powerful? So omniscient? 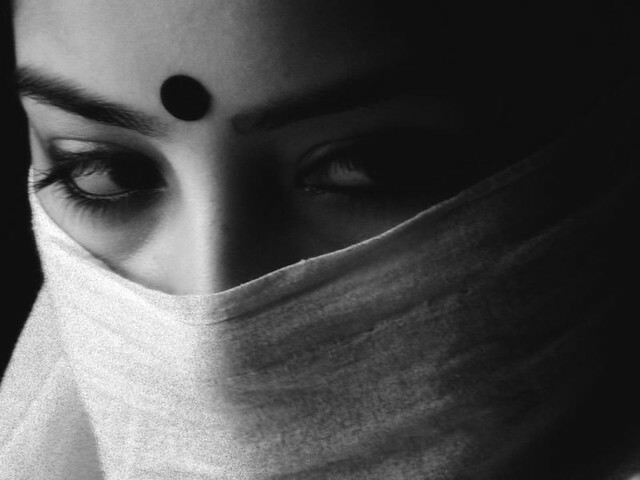 Welcome to the scar on the face Section 294 of the IPC of 1860, which deals with obscenity laws in this country, and is generally used by policemen for earning those few extra bucks for their hard work of harassing innocent young couples. Here’s how it goes. Now that’s what I call the death-knell of individual freedom. And that’s because of those three little highlighted words in there. What is ‘annoyance’? In the maddening motley of noodle straps and noodle-nourished necrophilia, spaghetti and spirituality, premarital abstinence and preposterous abuse that is India, how do we define what is ‘obscene’? The spine-chilling aspect of this Section however, is the ‘others’. If ‘annoyance’ of some unqualified group of ‘others’ could be the legal basis for determining the degree of criminal offense committed, we could just as well blissfully repeal our legal code altogether and defer all legal decisions to “the majority”. To take an example – I’m sure a great majority of Indians would consider love marriages “annoying”, if the sheer proportion of Indian marriages that are arranged is anything to go by. Does that mean a “love marriage” is a crime as per the IPC? We’ve all (I hope) heard of those magnificent things called “individual rights”. The legal code stipulates what falls within and outside of these rights. If the majority finds the exercising of any of these rights offensive, I should think it’s their business to learn to deal with it. Our law however leaves “obscenity” and “annoyance” to extortion. Did I say extortion? I meant interpretation. Unfortunately for the common man the only significance of that tiny room for interpretation is the brilliant scope of extortion and harassment created within it by some resourceful government servants (read police-people). As a totally irrelevant and insignificant aside, I’d like to mention that we were already married when the Worli sea face incident occurred. Repeat – We were already married when the Worli sea face incident occurred. “But why do you think telling that to the police person would’ve made any difference? He accused us of performing obscene acts in the public, and whether we’re married or not has got nothing to do with it – isn’t that so?” My poor guy enquired innocently. “Oh that’s only inside your logical little brain dear. This is India. Marriage is the ultimate license for any act of affection between a man and a woman – obscene or otherwise.” I sighed. Apparently my instincts had not lied. It is inconceivable how … the expression of love by a young married couple, in the manner indicated in the FIR, would attract the offence of obscenity and trigger the coercive process of the law. That’s what Justice Muralidhar of the Delhi High Court had to say in his judgement, dismissing obscenity charges brought on by an FIR filed against a married couple caught kissing in public, in 2009. Incidentally, the police overlooked to name any “annoyed” complainants in this FIR. Married? Unmarried? Legal? Illegal? Seen? Obscene? 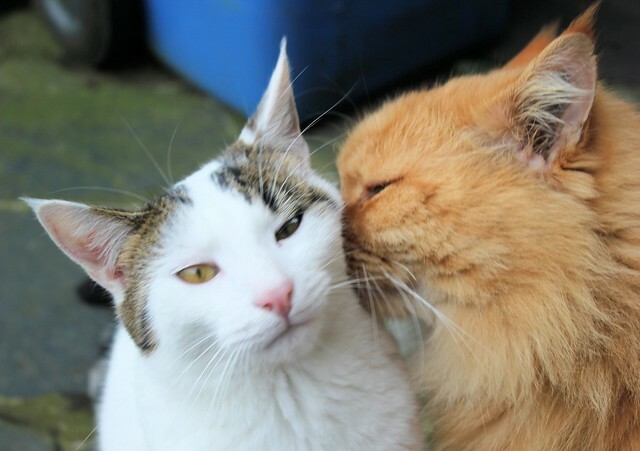 The jury is still out on the question of legitimacy of Public Display of Affection (PDA) in its varying degrees and contexts. But here’s something that’s certain – as long as the laws remain antiquated and unclear, and the police remain free of a stipulated code of permissible conduct while dealing with possible offenders at the scene, harassment and extortion of young innocent couples by the force responsible for upholding the law, are here to stay. She’s reached her limits. After the deadly dose of ten excruciating helpings, her nerves just won’t take any more of it. Any more of my Valentine’s Day posts, that is. 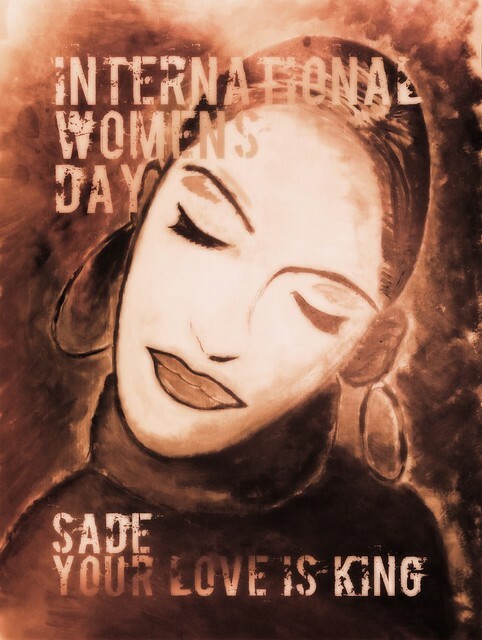 She – the mingleness-aspiring single – has threatened to break up with Love in India, if we continue to ignore her existence in the way we have (she alleges) over the last ten Valentine’s Day posts (or two weeks). Without risking any more of her patience, I’ll jump right into the answer. Talks to you without any reason: Does he keep pinging/texting you but it always seems to be “for no particular reason”? Most guys feel a little shy and nervous around the girl they like. This makes them beat about the bush when they’re talking to her. If a guy seems to really like talking to you, but it’s never “about” anything, watch out. Gets nervous around you: Next time you’re around him, ask yourself – “Does he like me?” and look for the answer in his body language. Have you noticed how he behaves? That shifty look and blushy smile? 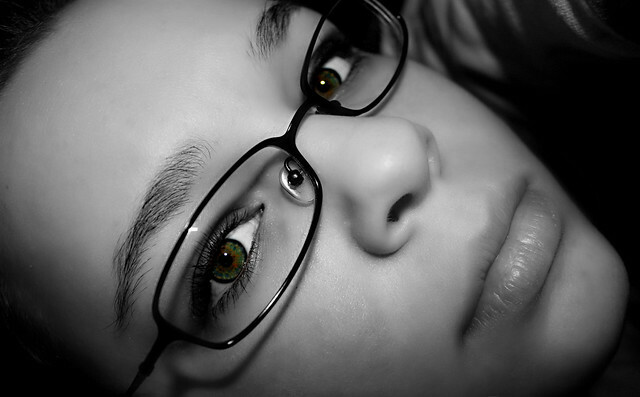 Those longing eyes which won’t stop staring at you if it seemed you were not looking? Shy attraction, coupled with an inability to be open and relaxed usually means he might have something going for you. Concerned for you: He shows a lot of concern at the slightest sign of any trouble for you. If he’s one who doesn’t hesitate to involve himself in your troubles just to help you out – he definitely has a thing for you. Asks you how to get a girl: Once he’s started to lose is shyness a bit, he tells you that he’s looking for a girl. He describes the attributes of his ideal girl, which – needless to say – match perfectly with yours’. He even asks you if you know someone who would fit his bill. If a guy is telling you to find you a girl for him who’s just like you, rest assured – he’s fallen for you. All his interests seem to match yours: Whenever you mention some interest of yours, he usually echoes. If it seems all his interests are miraculously aligned to you, he’s probably quite into you. Okay, Miss. Mingle-minded single? Does that make sense? Would you come back and tell me if they worked? The comments section’s all open for you. I’ll go try to calm my nerves now. The break-up threat was really a scare. Here’s #7 – the final one in Love in India special series of DIY Valentine’s Day Cards, which are exquisite, original and all take less than 10 minutes to make. I call today’s card “The Tajmahal of My Love.” You’ll find out why. 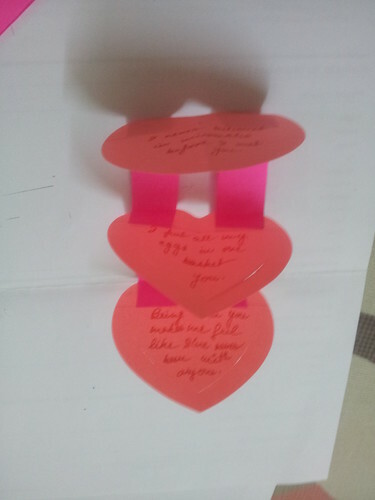 Valentine’s Day card 7 step 1: Take 2 sets of 3 heart-shaped post-its each (of two different colours). 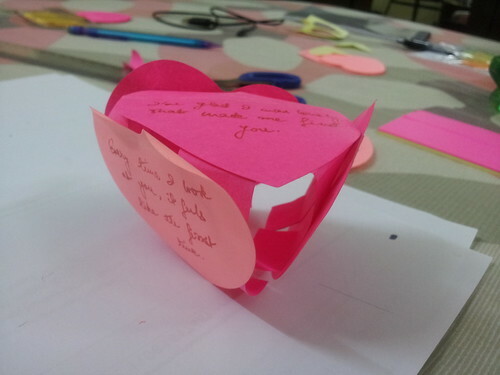 Or make heart-shaped post-its from ordinary post-its as shown in Valentine’s Day Card Workshop 2. 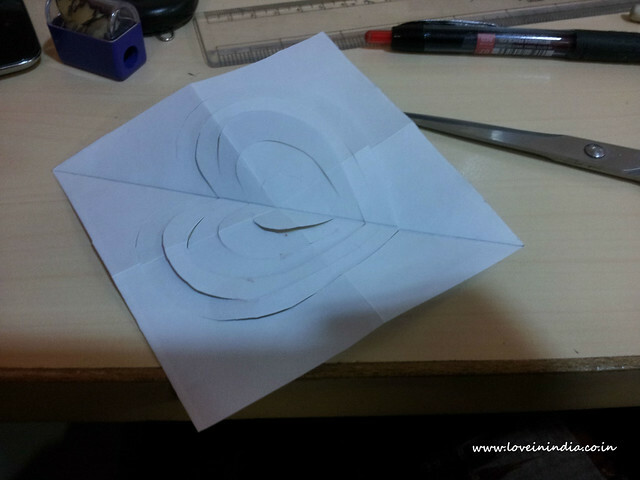 Valentine’s Day card 7 step 2: Take one of the sets and draw the tail of a smaller heart (inside the boundaries of the heart-shaped paper). It’s not necessary to draw the entire heart. 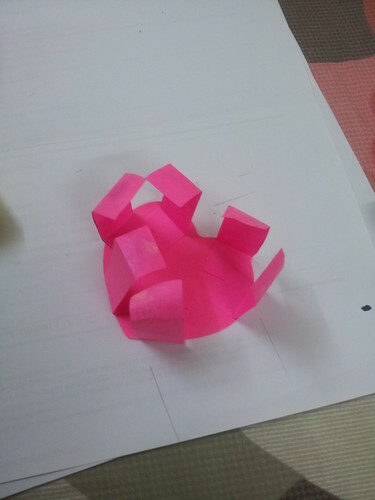 Now cut along the line so that each of the 3 post-its in this set have a slit in the shape of the tail of a heart. 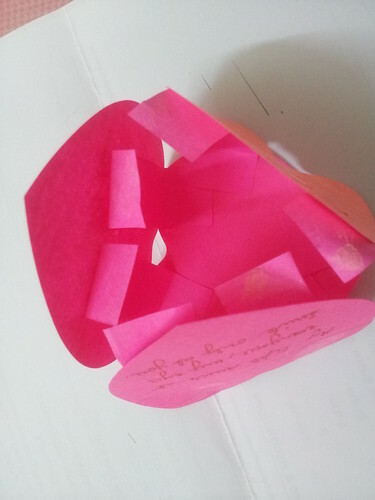 Valentine’s Day card 7 step 3: Fit one post-it from the other set into each of the slits (don’t attach with glue). 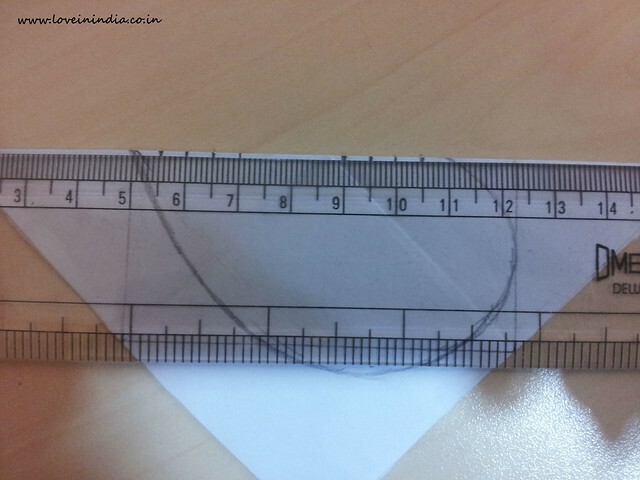 Then mark out two points on the joint spine, equidistant from the two ends. 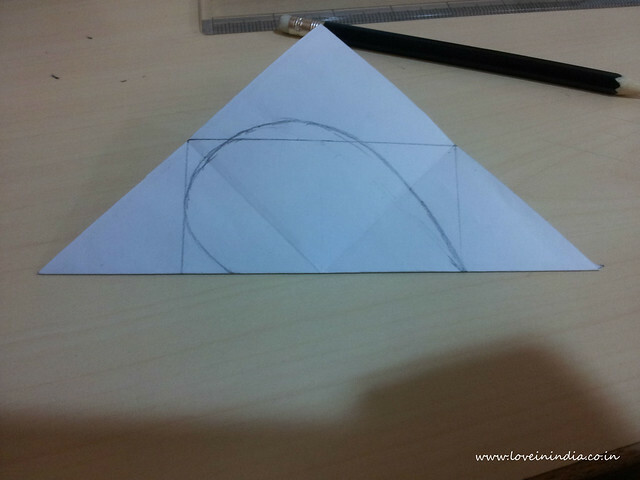 Then draw two lines parallel to the two shoulders, through this point. Repeat this for each of the three pairs. 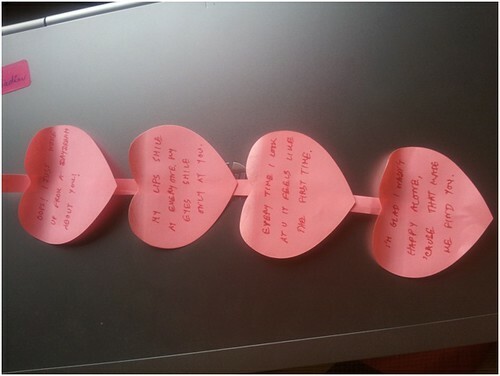 Valentines Day Card 7 step 5: Make eight strips of coloured paper (you can cut these out from other similar post-its). These would serve as the pillars of my Tajmahal. 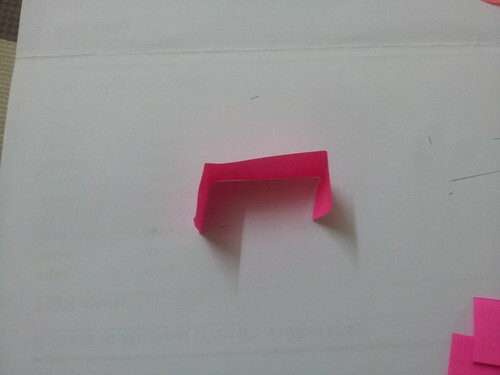 Valentines Day Card 7 step 6: Make little folds on both the ends of each strip and put glue on them. 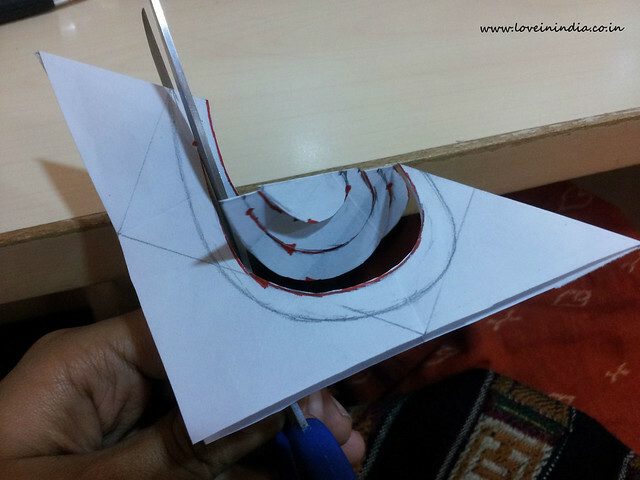 Valentines Day Card 7 step 7: Now get to work building your Tajmahal, attaching the floors (the heart-shaped panels) with your pillars. Each heart will have two pillars attached to it, and only in the portion above the shoulder-lines you drew on each of them. This will ensure that the pillar don’t interfere with the quotes. Make sure all the quote-ed sides face the same side in both the sets. 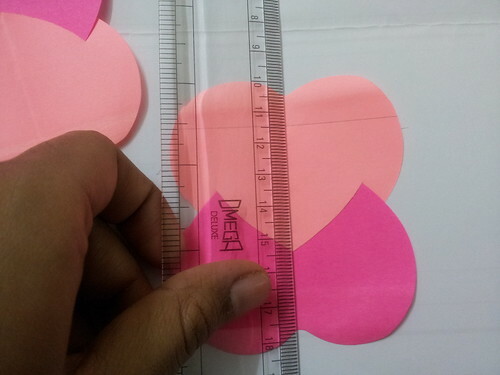 Valentines Day Card 7 step 8: Let me see how dextrous you are with your fingers as you now fit the un-slit hearts into the slit-ed ones. J This is how it will look from the top when your Tajmahal is done. Note how there’s no hint of the quotes when you look at your Tajmahal from the top. More about that later. Valentines Day Card 7 step 9: Present your sweetheart with your Tajmahal and tell them, “Go on. Blow up the palace of my love.” All your feelings will be tumbling out in the form of your quotes when they blow it up. Here’s #6 – the last but one DIY Card in Love in India special series of hand-made Valentine’s Day Cards, which is always the best gift you could ever give your sweetheart. Like all of my DIY projects, this one shouldn’t take more than 10 minutes of your time. 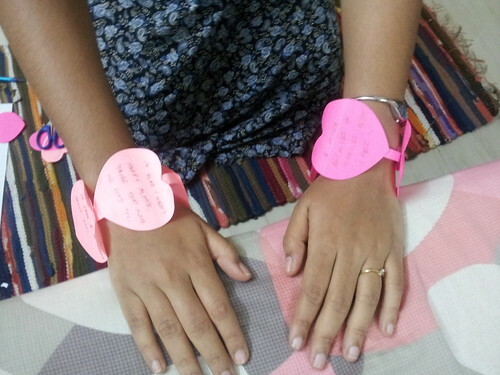 “My Heart Beats for You”– that’s what your sweetheart will say when they receive this very special gift from you. 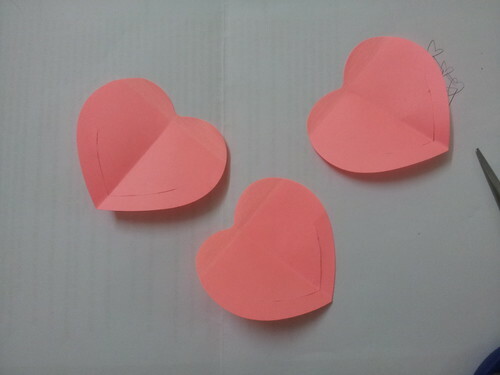 Valentine’s Day card 6 step 1: Take four heart-shaped post-its ( I leave the colour selection to you – they can be of same or different colours, or a combination of sets of two…go nuts ;)). 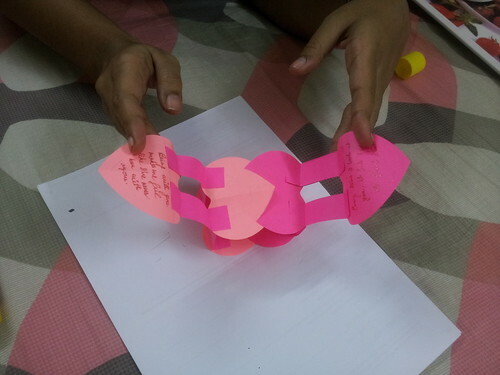 You can also mheart-shaped post-its from ordinary post-its as shown in Valentine’s Day Card Workshop 2. 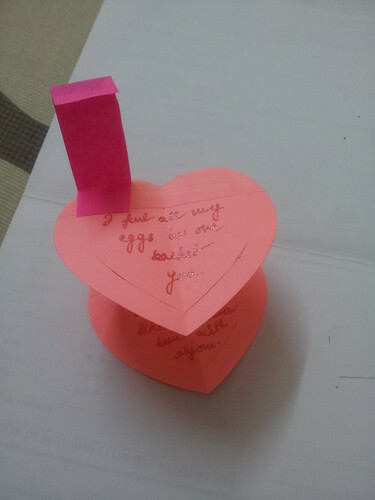 Valentine’s Day card 6 step 2: Fill them up with your favourite love quotes. 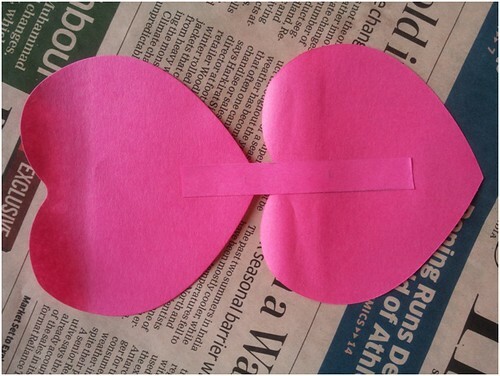 Valentine’s Day card 6 step 4: Make little folds on both the ends of each strip and put glue on them. 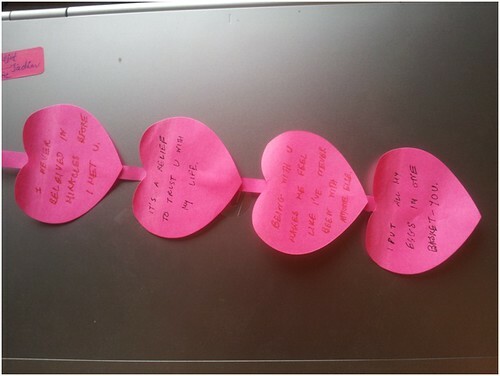 Valentines Day Card 6 step 5: Now string your heart together, attaching the valves (which are nothing but your love, I mean the heart-shaped post-its with your quotes on them) with the arteries (the strips). 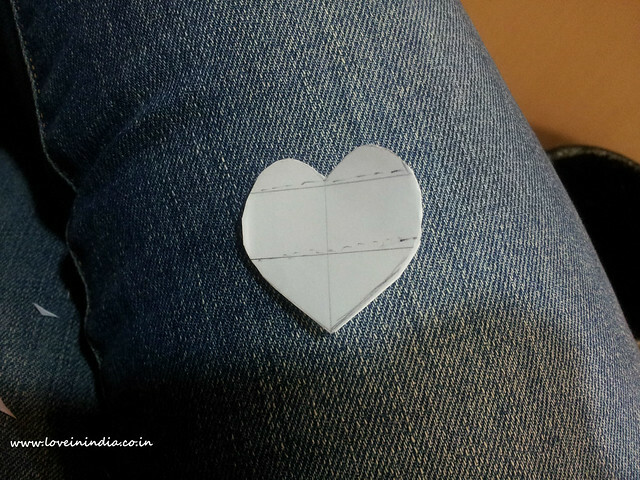 You’ll first choose a base heart, and then stick the six strips (here onwards called pillars) in such a way that you can attach three other hearts to it – one on each side – to eventually create a 3D heart. 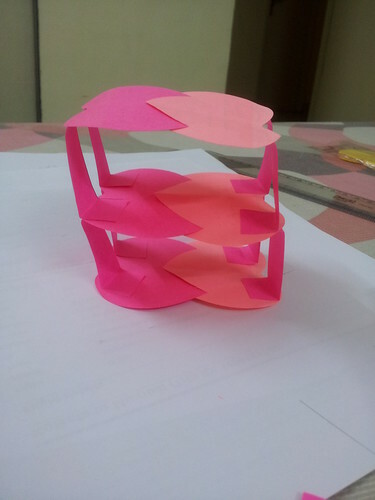 So here are two pillars stuck on to the two rounded peaks near the head of the base heart. In addition there are two pairs of parallel pillars on each of the sides of the base heart. Here’s your final beating heart. 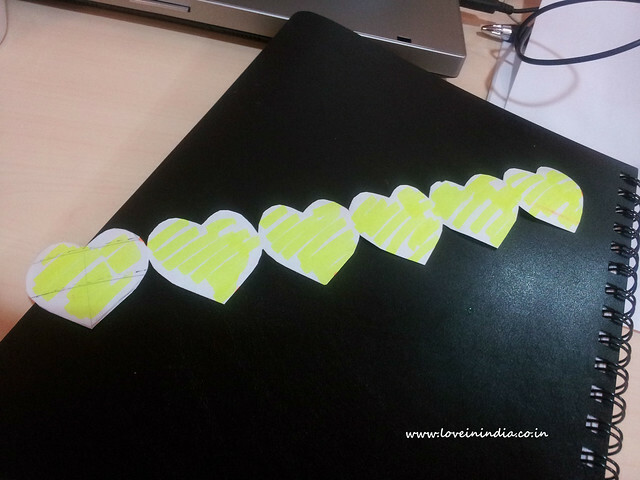 Here’s #5 in Love in India special series of DIY Valentine’s Day Cards. Their speciality is that while they’re all exquisite (which you’ll get in many DIY sites around the web), they’re also original and most importantly – each take less than 10 minutes to make (which you’ll not get anywhere else ;)). 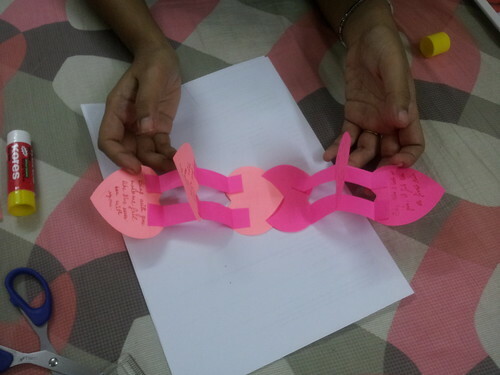 Today’s is called “Chains of Love”. Here’s the final version. 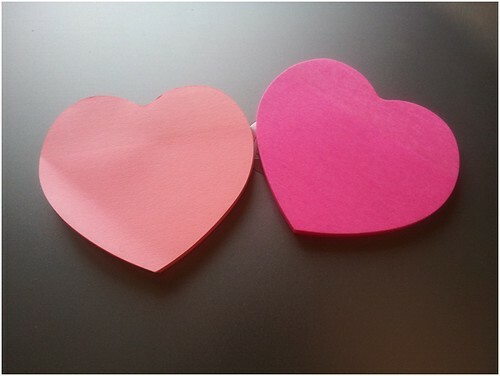 Valentine’s Day card 5 step 1: Choose heart shaped post-its of two different colours. 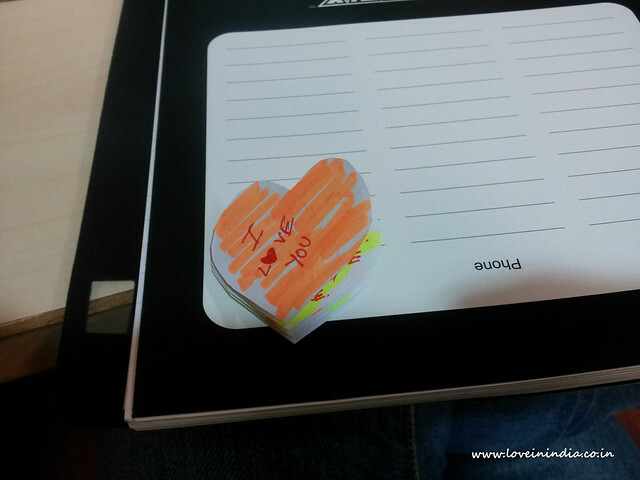 Or make heart-shaped post-its from ordinary post-its as shown in Valentine’s Day Card Workshop 2.Take 4 of each. 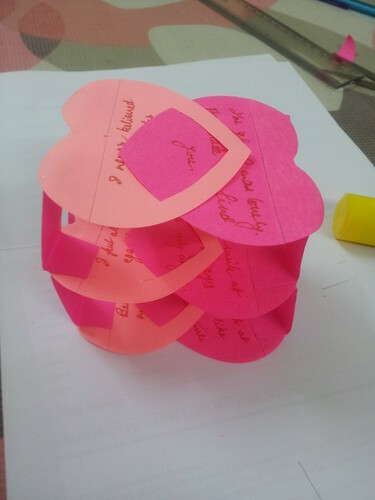 Each set of 4 post-its is used for making one chain link. 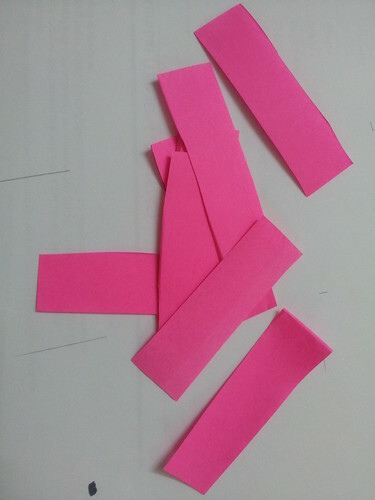 So we’re choosing 8 post-its for making a basic 2 link chain. If you want to make a longer, more gorgeous chain, you can choose any number of post-its as long as it’s a multiple of four. 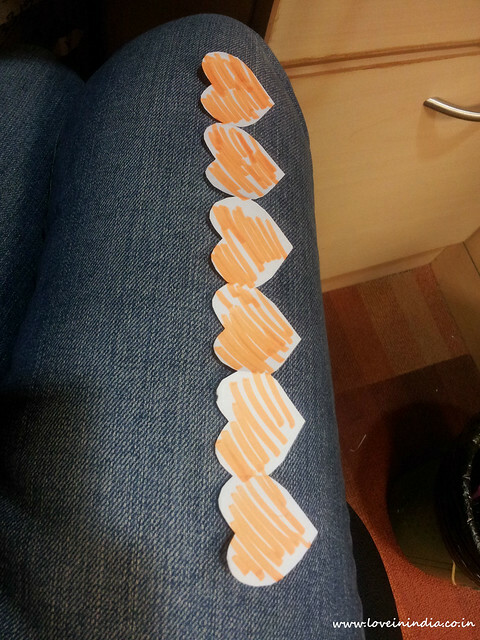 Valentine’s Day card 5 step 2: Make 8 equally sized coloured strips of paper. These would serve as the links in the chains of hearts. 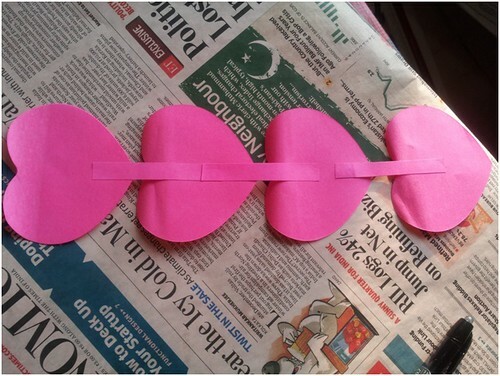 Valentine’s Day card 5 step 3: Put glue on the two ends of each strip and use them to connect two heart-shapes each. You now have the basic units of the two chain links. 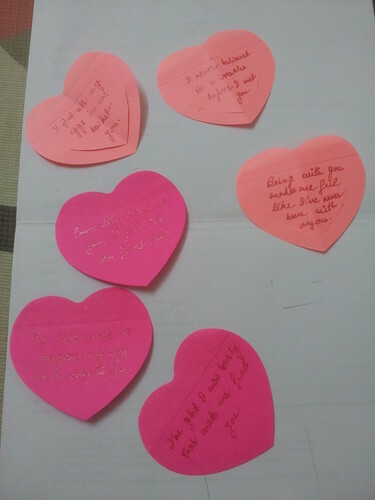 Valentine’s Day card 5 step 4: Decorate each chain link with your favourite quote on each post-it. Valentines Day Card 5 step 5: Complete the first chain link by connecting the first post-it with the 4th, with the help of a connecting strip. Valentines Day Card 5 step 6: Complete the next chain link through the first. You now have a complete chain of love. 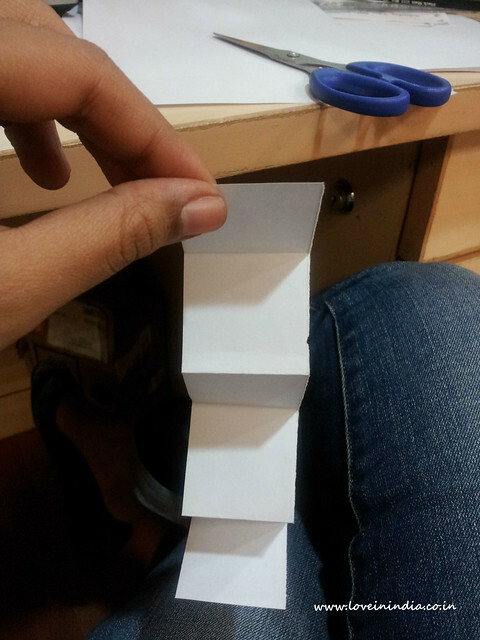 Valentines Day Card 5 step 7: Fold up the entire thing. 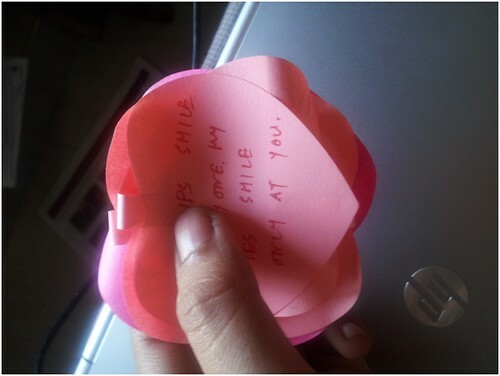 It will make it look like a clumsy compilation of quotes to the person receiving your gift. I’m sure you can imagine their surprise when they open it up and see your gorgeous chain of love. Valentines Day Card 5 step 8: Alternatively you can create the two links separately and use them as love bands to be worn around the wrist. Hi friends. I’m Anuradha Mallick. You wouldn’t have heard of Mogra – the little town about an hour and a half away from Kolkata where I grew up – or my school, Dr. B.C. Roy High School. It’s here that I first heard about Valentine’s Day – or “Vegetable Day” as it was known among the kids back then. To us, it meant gossip. Loads of it. Who got the maximum number of proposals from boys? Who got the most candy? Ah the days of childhood. I had to leave them behind though (don’t we all? ), and went on to earn my B. Tech. (still battling its final throes), along with pursuing my dreams of becoming a photographer. I was in my 2nd year when it happened. 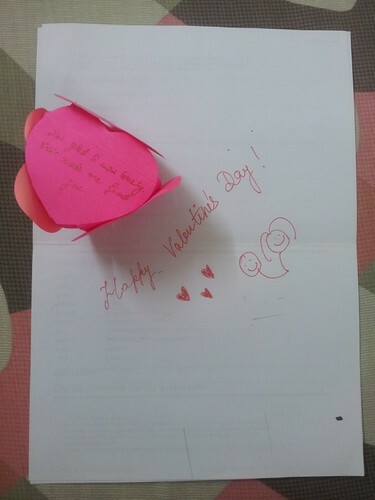 It was 14th Feb. I was about to go out for a jog, when I discovered it just by the door. A box full of chocolates, and a bunch of exquisite red roses. No note. No sign. Expectedly, it was a shock. I can’t deny that sudden flutter in my stomach and that hot feeling on my cheeks. I strived to tell myself that it may not be for me, but I knew it was. A rush of confused feelings flooded my system. Happiness. Panick. Dizziness. Excitement. Unfortunately my first surprise Valentine’s Day gifts had to end up in the wild bushes behind our home. Bringing them in would’ve raised eyebrows. And I didn’t want to be asked pointed questions about my non-existent boyfriend. The next year my anonymous admirer surprised me with his intimate knowledge of my taste of chocolates – I got a bar of Bourneville and one of Crackle that year, which I’d acquired a taste for only shortly before. Another year my niece discovered my present, went wild with juvenile curiosity and got me into trouble by somehow managing to involve my parents. It was hilarious. I still receive my roses and box of chocolates every Valentine’s Day. The sender is still elusive. I’m still searching. Note: Anuradha is one of the first and most ardent fans of Love in India. 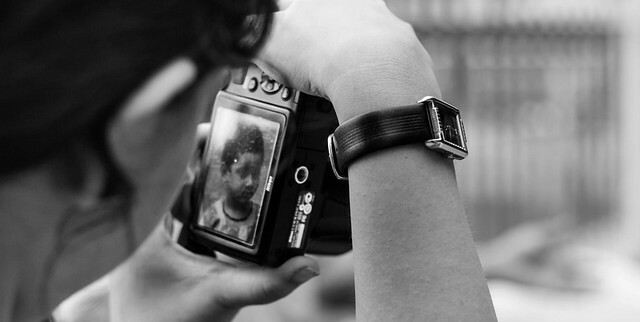 She’s also one of the few budding photographer friends whose photos I love. 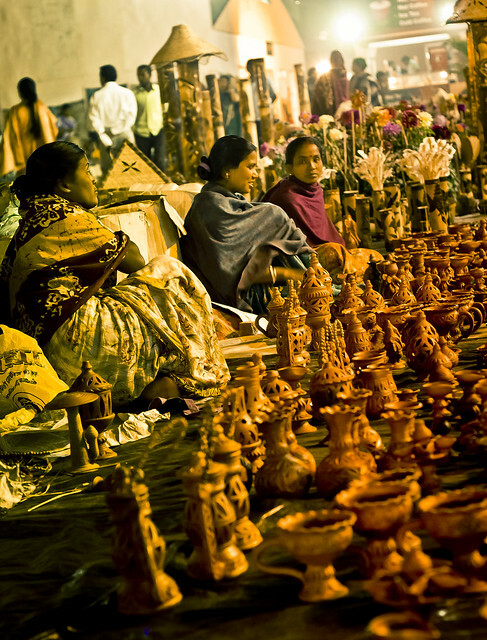 Do check out her page Anuradha Mallick photography for a taste of her talents. As promised, here’s #4 in Love in India special series of DIY Valentine’s Day Cards, each of which take less than 10 minutes to make. 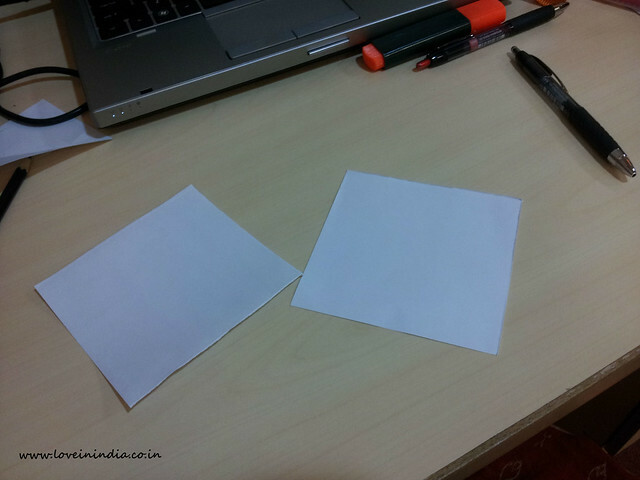 Valentine’s Day card 4 step 1: Take two identical square pieces of paper. 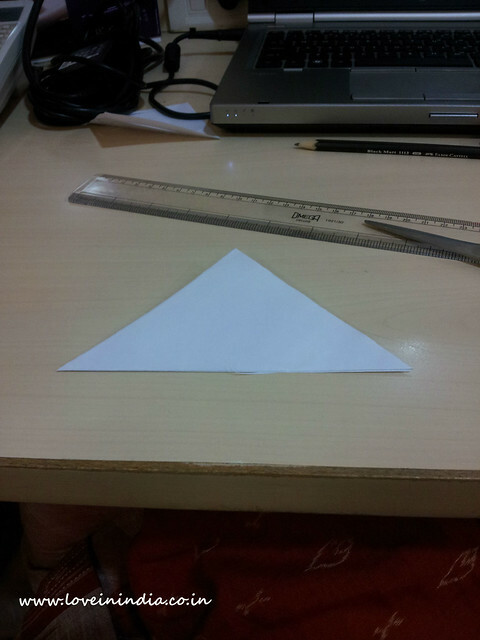 Valentine’s Day card 4 step 3: Fold it twice such that eventually there are three creases across its length and breadth, intersecting at a common point at the centre. 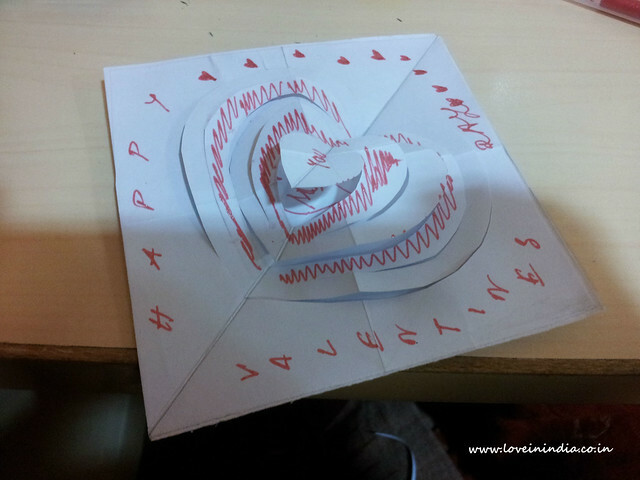 Valentine’s Day card 4 step 4: Join the mid-points of the four sides to draw a square, touching each side of the paper at the mid-point. 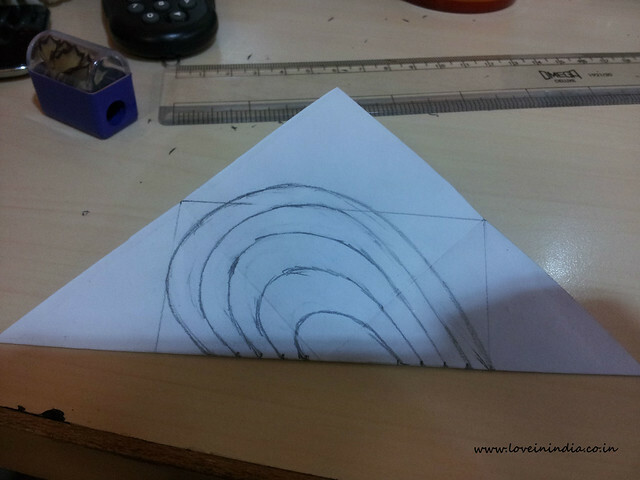 Valentines Day Card 4 step 5: Fold it along the diagonal, and draw half a heart on one of the sides, using the inner square as a reference. 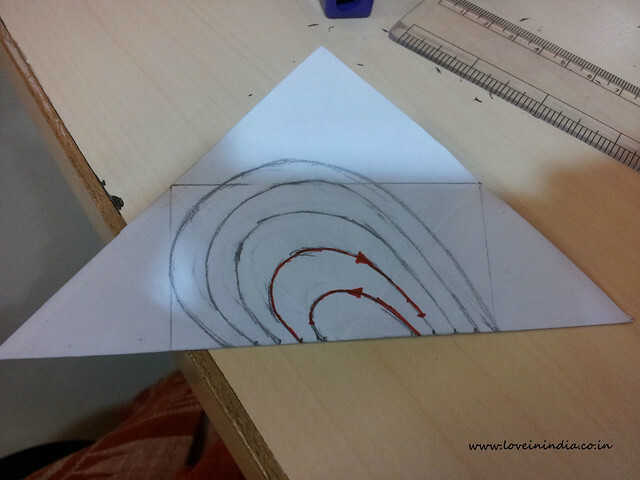 Valentines Day Card 4 step 6: We are going to draw many “parallel” hearts inside this outer heart. Let us start by marking the starting and ending points of each heart on the spine of the outermost heart. Make the equidistant from each other, leaving out space for the innermost heart in the centre. 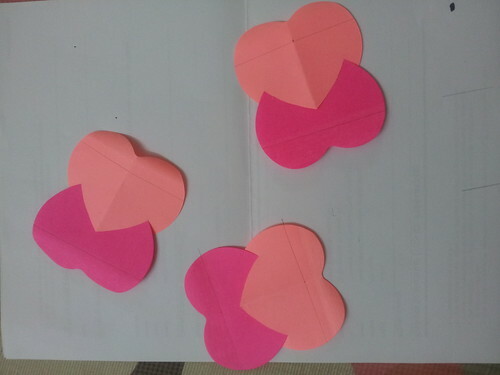 Valentines Day Card 4 step 7: Draw the hearts, one inside the other, as identical as possible. Valentines Day Card 4 step 8: Now the trickiest part. 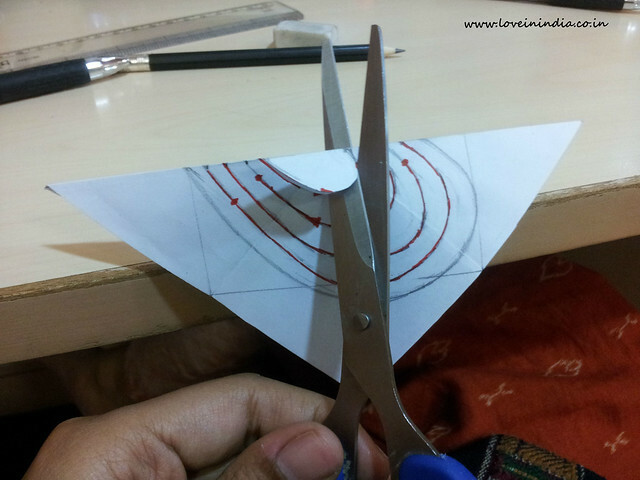 Each heart has to be cut out from the head and left joined with the others at the tail, or vice versa. Each heart has to be cut in alternate directions – one from head to tail, the next from tail to head. Like this. 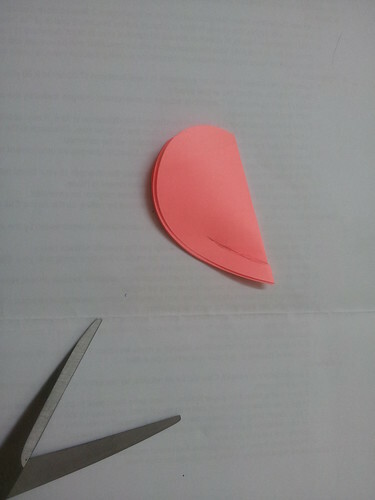 For your convenience, I have marked out the alternate directions of cutting on the first two hearts (don’t repeat this unless you want to leave out awkward red arrows on your special valentine’s day card!). Note that each red line as an ending point marked with a prominent red dot. 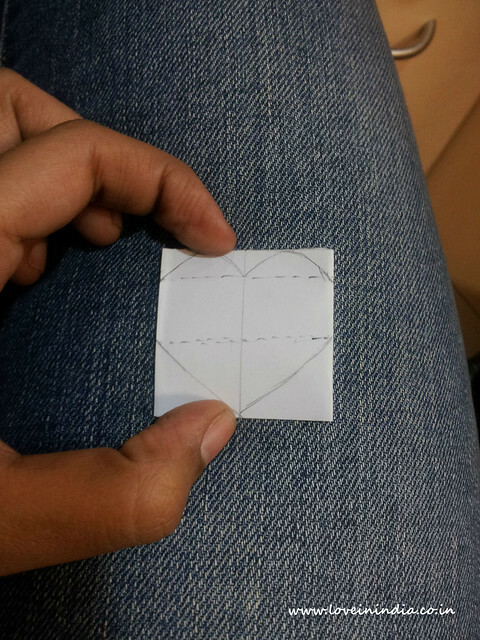 Each heart is to be cut only till its respective ending point, to leave it joined with the rest of the paper. This will create the layered effect you can see in the final version. Valentines Day Card 4 step 9: Now stick the square piece of paper with the layers at the centre on to the other identical square you’d kept aside. Here are we with the 3rd in the series of Valentine’s Day Card Workshops. 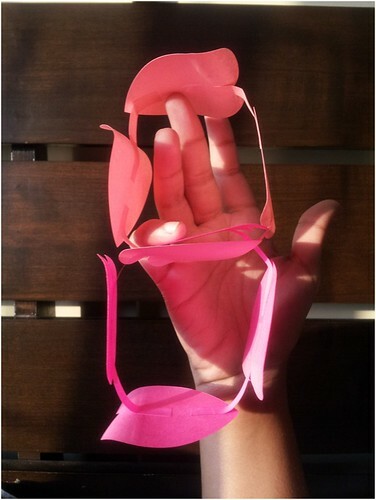 Today’s folds of love are called The Maze of My Love and here’s what they look like. 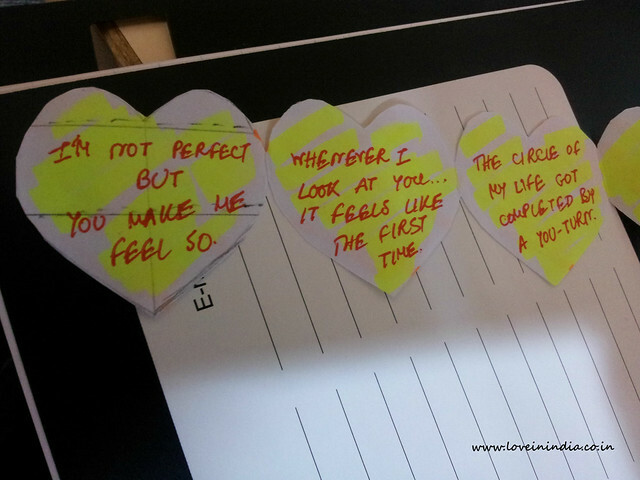 Read on if you want to convey your love to your sweetheart through this sweet maze of your feelings. 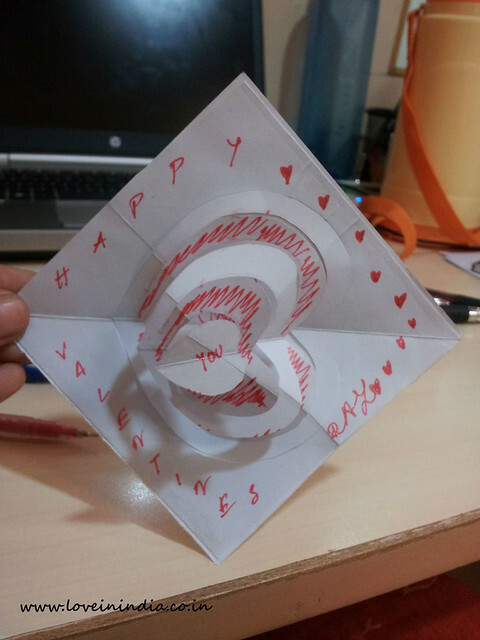 Valentine’s Day card 3 step 1: Cut a strip of plain white paper and crease it in a series of folds, like this. 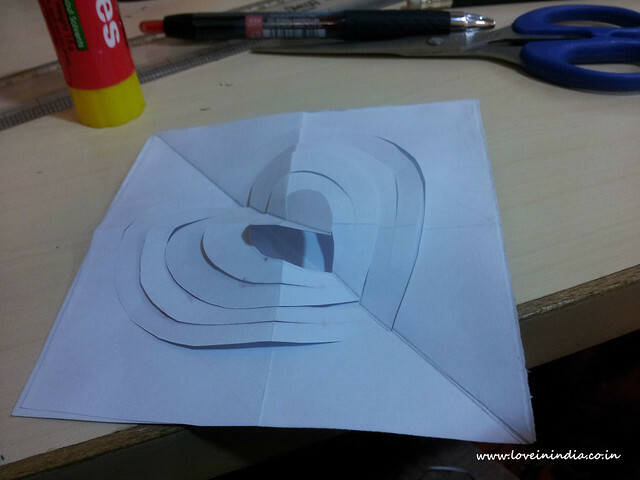 Valentine’s Day card 3 step 2: Fold it up and draw a heart shape on one of the top faces, which you’re going to cut out. 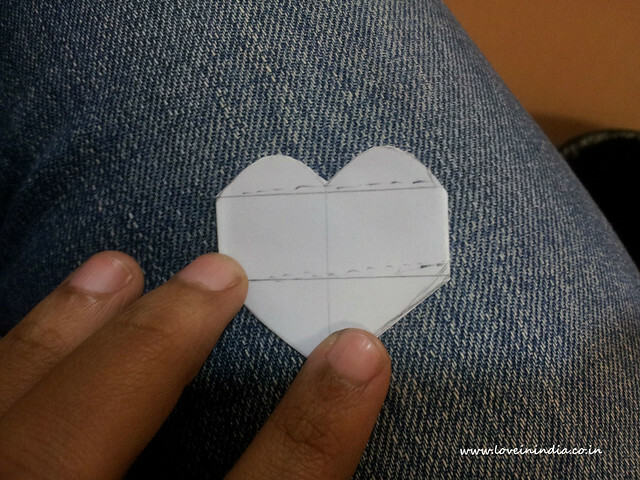 Valentine’s Day card 3 step 3: Cut out the whole strip in the shape of a heart. 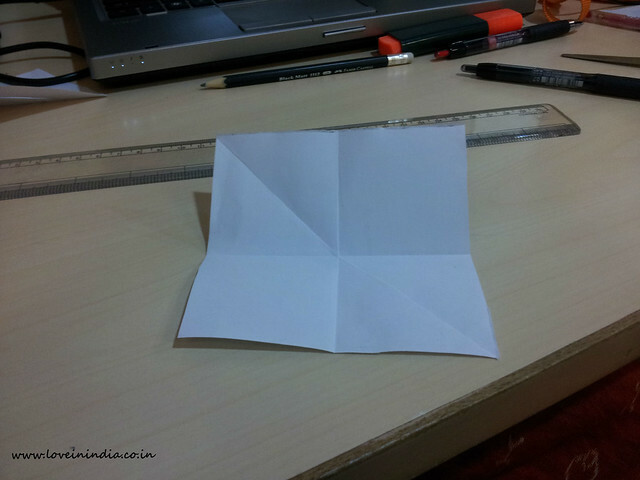 Make sure the edges (where each plane of paper is joined with others in the strip) are intact. 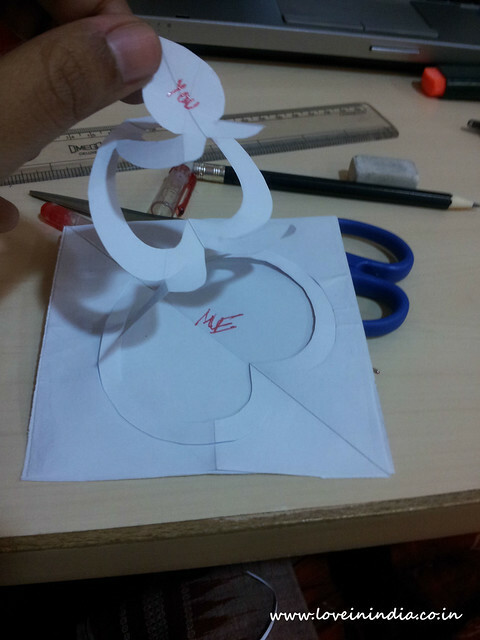 Valentines Day Card 2 step 4: Smooth out the oblong edges to give the hearts a full, rounded look. Now you have the base for the maze of your love. Valentines Day Card 3 step 5: Colour it as you like. 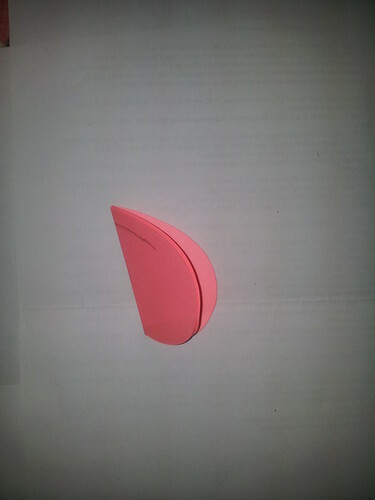 I’ve simply chosen two colours for the two sides. 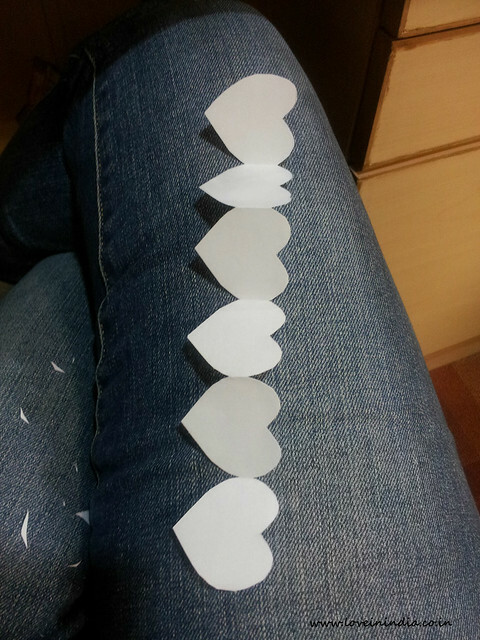 You can also choose a different colour for each heart-shaped petal. Valentines Day Card 3 step 6: Choose your favourite quotes. Or just make them up. 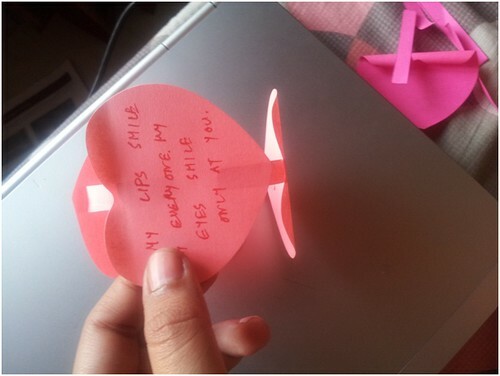 Write a different quote/message in each petal. 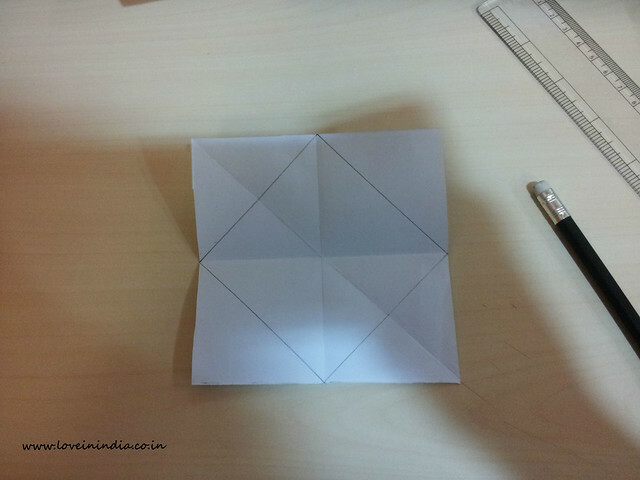 Fold it up neatly. 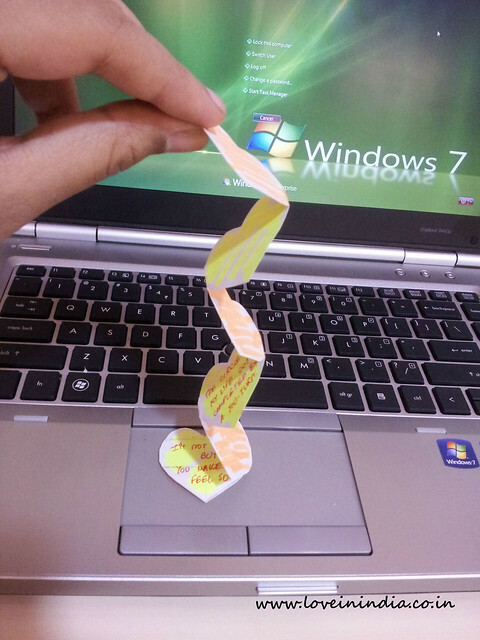 And you have the “Maze of your love” ready for surprising someone!